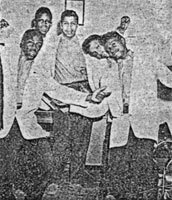 Groupe US de Doo Wop originaire de New Haven (Connecticut). Les "Five Satins" ont été formé au mileu des années cinquante par Fred Parris tout d'abord sous le nom de "The Scarlets". 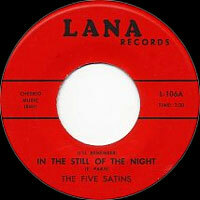 Le groupe comprenait Fred Parris, Lou Peebles, Stanly Dortche, Eddie Martin et Jim Freeman. Leur premier disque est sorti sur le label local Standord Records, puis ils sont passés chez Ember, First, Club, Chancellor, Warner Bros., Roulette et Mama Sadie Records. Ils se sont nommés aussi "The Wildwoods", "The New Yorkers" et "Black Satin". 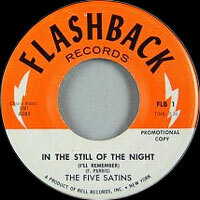 The Five Satins are best known for the doo wop classic "In the Still of the Night," a song that was popular enough to make the group one of the most famous doo wop outfits, although they never had another hit of the same magnitude. 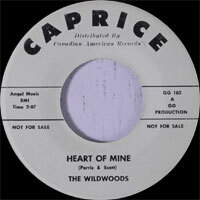 The origins of The Five Satins lie in the Scarlets, a New Haven, CT, doo wop group led by Fred Parris. 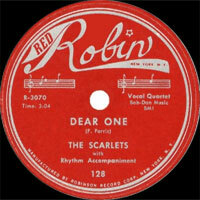 the Scarlets formed in 1953, while Parris was still in high school. 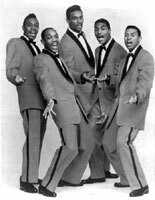 The group had a local hit with "Dear One" the following year. 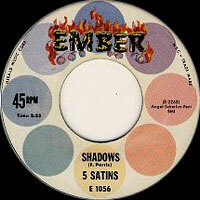 In 1954, Parris formed The Five Satins with Vocalsists Al Denby, Ed Martin, and Jim Freeman. 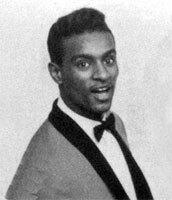 Within the next year, Parris had the group record "In the Still of the Night," a song he had recently written in the basement of a local church. 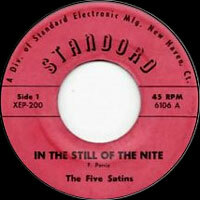 The first single the group released was "In the Still of the Night." 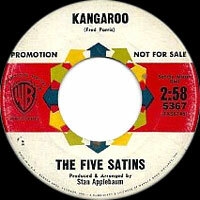 The single was released on Standard Records in the spring of 1956. By the end of the year, it had been leased to Ember and became a huge hit, peaking at number three on the R&B charts and number 25 on the pop charts. 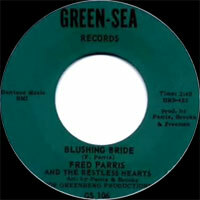 By the time "In the Still of the Night" scaled the charts, Parris had been drafted into the army. He was stationed in Japan when the song became a hit, and he was still stationed in Japan when the group recorded the follow-up single, "To the Aisle." 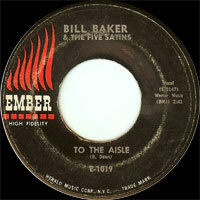 For that single, Bill Baker handled the lead Vocalss. 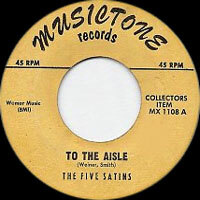 "To the Aisle" became a Top Ten R&B hit in the summer of 1957. 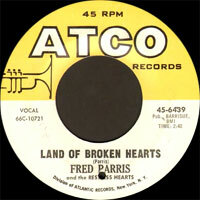 Parris returned from the army in 1958. 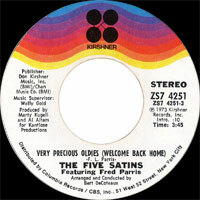 Upon his return, he reorganized the group, adding Richie Freeman, Sylvester Hopkins, West Forbes, and Lou Peeples. 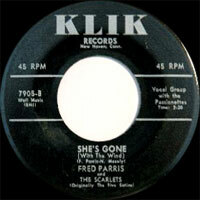 This incarnation of the group had a minor hit in the fall of 1959 with "Shadows." 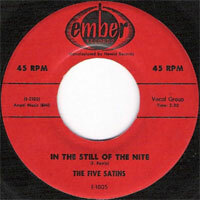 In 1960, "In Still of the Night" re-entered the pop charts thanks to its exposure on Art Laboe's first Oldies but Goodies compilation. 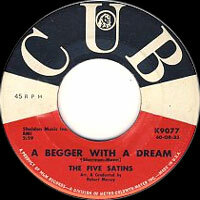 The repeated success of the single sparked another minor hit for the band in 1960, a cover of the standard "I'll Be Seeing You." 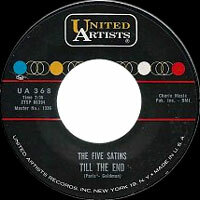 During the remainder of the '60s and early '70s, Parris led various incarnations of The Five Satins through oldies revues in America and Europe; they also recorded occasionally during this time. 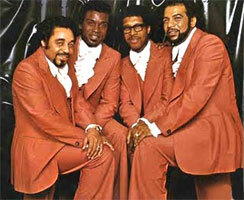 In 1974, the group signed a contract with Kirsner Records and released a single, "Two Different Worlds." 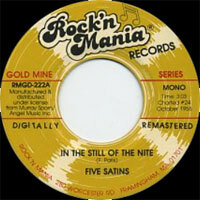 Two years later, they briefly changed their name to Black Satin and released a single called "Everybody Stand Up and Clap Your Hands (For the Entertainer)," which became a Top 50 R&B hit. 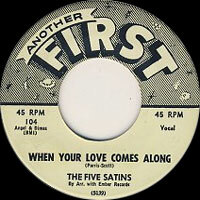 Shortly afterward, the group reverted to The Five Satins name. 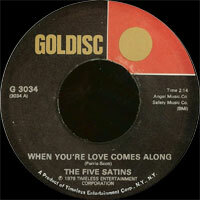 In 1982, The Five Satins had their last hit with a doo wop medley entitled "Memories of Days Gone By." 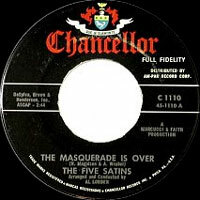 The single, which was released on Elektra Records, peaked at number 71 on the pop charts. 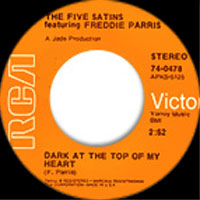 Since the '80s, Fred Parris has led various lineups of The Five Satins and the group performs regularly at oldies shows in America and Europe. 03/1957 SP EMBER E-1014 (US) . 02/1958 SP EMBER E-1028 (US) . 07/1958 SP EMBER E-1038 (US) . 06/1959 SP FIRST 104 (US) . 03/1960 SP EMBER E-1061 (US) . 1960 SP CUB K9077 (US) . 03/1961 SP CUB 9090 (US) . 10/1961 SP UNITED ARTISTS UA 368 (US) . 05/1962 SP CHANCELLOR C 1110 (US) . 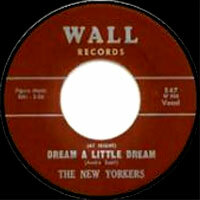 11/1963 SP TIME SQUARE 21 (US) . 1964 SP ROULETTE 4563 (US) . 1964 SP TIME SQUARE 94 (US) . 04/1965 SP CHECKER 1108 (US) . 1965 SP LANA 106 (US) . 09/1966 SP ATCO 6439 (US) . 1966 SP GREEN SEA 106 (US) . 1966 SP GREEN SEA 107 (US) . 1967 SP MAMA SADIE 1001 (US) . 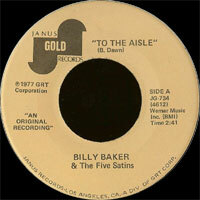 04/1971 SP RCA VICTOR 74-0478 (US) . 1973 SP NIGHT TRAIN 901 (US) . 12/1973 SP KIRSHNER ZS7 4251 (US) . 05/1974 SP KIRSHNER ZS7 4252 (US) . 197? SP TIME MACHINE 570 (US) . No One Knows (a cappella) / ? 197? SP TIME MACHINE 571 (US) . 1990 SP SIGNATURE 001 (US) .